This is one of the coolest staircases I have seen! 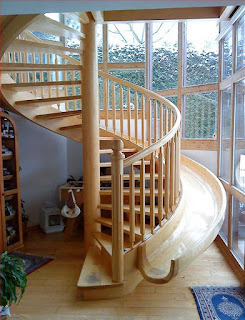 A spiral stair with a slide on the side like that will be an awesome part of your home, especially if you have kids (or if you love slides). Also, this made me interested to install this to my metal spiral stairs since it is stable enough to have one. As a fan of metal furniture, I usually have a lot of them at home, and when my friends visit me for our weekly football night, my ornamental iron doors is the first thing they will see.